【JWF News Vol. 169】４℃ AQUA PROGRAM 2018 started! - ４℃ AQUA PROGRAM 2018 started! In my foreword to the October issue, I referred to the history of global climate change. However, we should look not only back into the past, but also into the future. Regardless of its causes, global warming is steadily progressing. Due to global warming, the weather has become more severe and erratic, ravaging the Japanese archipelago. The term severe and erratic weather refers to abnormal torrential rains and droughts. 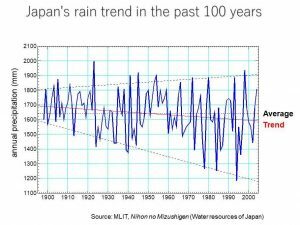 Figure 1, which shows rainfall data for the past 100 years, clearly indicates such a trend. The amount of precipitation varies a great deal between years of highest and lowest rainfall. In the future, severe and erratic weather will subject us to heavy rains and serious droughts in turn. Moreover, the frequency and timing of such extreme events are unpredictable. This is a feature of severe and erratic weather. A flood prevention plan is drawn up based on a particular prediction method. This method uses long-term rainfall data for the past century, assuming that the pattern of the past will be repeated in the future. Therefore, a once-in-a-century torrential rain event is considered the heaviest rainfall in a century based on observation data for the past 100 years. However, increasingly erratic weather means that once-in-a-century torrential rains will hit us every ten years or even every two to three years, to put it in an extreme way. This can be said not only in the case of heavy rains, but also in the case of droughts. If the weather becomes more severe and erratic in the future, our infrastructure, planned and developed on the basis of historical data, will not be able to respond to water disasters that occur. Seventy-three years ago, our homeland was destroyed in World War II, and the land was ravaged by a series of powerful typhoons. The lives of Japanese people were lost by the thousand every year, like fallen leaves. The River Bureau of the Ministry of Construction (today’s Water and Disaster Management Bureau, MLIT), developed disaster prevention plans using data dating back to the beginning of Meiji Period and spent seventy years after the war improving its plans. Due to severe and erratic weather, these plans need to be reviewed. We must not only revise them, but also implement them in order to improve infrastructure. It is easy to review plans, but difficult to implement them. This is because Japanese cities have achieved remarkable development during the past seventy years, and populations and industries have concentrated in these urban areas. It is very difficult to widen rivers within cities in order to accommodate an increased flow of flood waters. For example, it took 68 years from planning to completion of work on the 1.4km-long MacArthur Road between Toranomon and Shinbashi in Tokyo. One measure for protecting these two areas from flooding is to build flood-control basins in the suburbs, and another is to construct dams in the mountains. It is difficult to secure land for building flood-control basins due to housing developments in the suburbs. Moreover, it is not easy to construct new dams in the mountains, when one takes costs and social conditions into account. But there are two other options. These are to change how dams operate and to increase the height of existing dams. 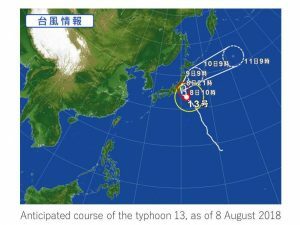 Forecasting technology for typhoons and heavy rains has dramatically improved. We can get the information before flooding occurs. Figure 2 shows a prediction of the route of a typhoon. When a powerful typhoon is expected to hit an area, officials can reduce the amount of water stored in a dam beforehand. Without constructing new dams, we can increase our capacity to store floodwaters. I’ll give you a specific example of the effective operation of a dam. In the early stages of a flood, water should be released to the lower reaches in order to increase flood storage capacity. When floodwater gradually increases, it will flow into the dam. In this way, at the flood’s peak, the water can be stored. When the flood passes its peak, the dam continues to hold water by balancing its inflow and outflow discharge, thus protecting the downstream areas. This is basically the current method of operation. During a flood, this method is used in an intensive way. In short, in the early stages of a flood, water is released in order to secure capacity in the dam. In the later stages, as much floodwater as possible is stored in the dam and the dam is utilized to its fullest, unless the next typhoon is not coming. In this way, we can make the most of existing dams for flood control and at the same time utilize them for hydro power generation. As described above, the operation of dams depends on the accuracy of weather predictions. Therefore, there are limits to this method. But there is another way, which is as effective as constructing new dams. We can increase the height of existing dams. Figure 3 is an example how a dam may be modified. The upper part of a dam is large in area. 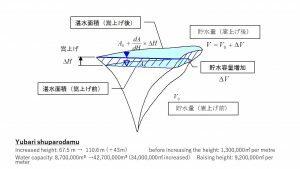 In the case the Yubari Shuparo Dam, an additional 340,000,000㎥ of water capacity has been secured by increasing the dam’s height by 43m. The capacity of the existing dam was 1,300,000㎥ per metre in height, however the capacity value of the additional area is 9,200,000㎥ per metre. The construction costs for modifying existing dams are far lower than for building new ones because the costs associated with submerging lands have already been paid. Four-fifths of dam construction costs are related to submerging lands, such as compensation for relocation, for shifting railways, and for replacing roads. Such costs aren’t incurred when we modify existing dams. Many existing dams have already been modified and the technology is well-established. By increasing the height of existing dams, we can secure new storage capacity. There are many effective ways to use this storage capacity, such as for flood-control by storing floodwater, for hydroelectric generation, and for providing drinking and agricultural water in the downstream. The security of Japan’s territory has been greatly improved against severe flooding and abnormal droughts. Changing how dams operate and increasing the height of existing dams are the most effective and quick remedies for severe and erratic weather in the future. Existing dams are valuable assets for the Japanese people. The 24th Session of the Conference of the Parties (COP24) is to be held from December 2nd to 14th in Katowice, Poland. It is an important international conference for discussing rules on the reduction of emissions of greenhouse gases and adaptation to the impacts of climate change. This conference will be attended by 20,000 representatives of governments from 197 countries and observer organizations, including UN agencies, international organizations and NGOs. Last year, the Japan Water Forum was admitted as an observer organization to the UNFCCC process. In its exhibition booth at COP24, the JWF will offer information about Japanese efforts to mitigate climate change and to adapt to it in water use and management. The JWF will also organize a side event to promote private actors' participation in water-related adaptation measures to climate change. ４°C AQUA PROGRAM was established in 2008 as a joint project with ４℃ and Japan Water Forum in the aim to support women who are struggling with water-related issues. Since the launch of the Program, distinguished projects have been carried out in Kiribati, Sri Lanka and Bangladesh. In the 2018 project, installing rainwater harvesting systems for 40 households, conducting training on operation and maintenance, awareness-raising for women will be carried out in Bagerhat District, Khulna Division, Bangladesh. Togo is an ideal destination for anyone looking for somewhere to volunteer in Africa for a short or long stay. Charité Chrétienne pour Personnes en Détresse (CCPD)* projects in Togo are perfect and offer you opportunities to get directly involved in making positive change in the needy communities. *CCPD is the winner of the 5th Kyoto World Water Grand Prize. Disclaimer: Japan Water Forum is not liable for the information of Bulletin Board. Please contact publisher for information.